Observations From Arizona | Energy and Gold Ltd.
After spending the last 72 hours in Scottsdale, Arizona at the Capital Events Conference I have some observations to share. Companies that I met with that stood out to me in terms of being potentially attractive investments/speculations were (in no particular order): Block X Capital (BXXX.CN), Ashanti Gold Corp (AGZ.V), Berkwood Resources (BKR.V), Golden Ridge Resources (GLDN.V), Japan Gold Corp (JG.V), Metallic Minerals Corp. (MMG.V), and Northern Empire Resources (NM.V). I am already a shareholder of Japan Gold and Northern Empire, however, I am considering adding to both positions this week. Ashanti and Golden Ridge are both highly speculative early stage exploration stories but both could deliver big returns to shareholders in the event of drilling success this summer. Berkwood is very interesting because BKR’s property package in Quebec essentially surrounds Mason Graphite’s property and Mason has a C$250 million market cap while BKR has a meager C$6 million market cap. There is evidence that Mason’s graphite find extends onto Berkwood’s land and contains the same high purity flake graphite that exitsts on Mason’s property. Block X Capital is a blockchain technology investment play with a very impressive management team and team of advisors. The company is in the very early stages and its current C$8 million market cap isn’t much more than the nearly C$5 million cash it has in the bank. If the blockchain/crypto space gets hot again and BXXX can prove to have an edge in identifying attractive blockchain technology investment opportunities, the current share price of C$.17 could prove to be very cheap. Metallic Minerals is a bit more advanced silver exploration play in the Yukon with an impressive portfolio of properties in a highly prolific silver rich area of the Yukon, the Keno Hill Silver District. It seems quite likely that with further exploration success Metallic could become an attractive acquisition target for neighbor Alexco Resource Corp. In addition there was a great deal of optimism regarding Excelsior Mining (MIN.TO) and the timing of receiving its final permit (UIC permit) needed before starting construction and beginning production at its Gunnison Copper Project in southern Arizona. The word is that the permit should be received in mid-May. With receipt of this final permit and a strong copper market MIN shares should finally stage a technical breakout above resistance near C$1.40 per share. In other news my weekend trip to Arizona proved to be a bearish omen for the gold price as gold has dropped $20 in a steady grind lower since Thursday morning. This pullback doesn’t change much in terms of the long term technical picture, however, it does indicate that perhaps gold is tired after spending so much time above $1350 in the last month. May and June are historically weak months for gold (gold often puts in a major seasonal low during July) which is something that gold investors should be mindful of especially if support near $1325 is breached in the coming days. 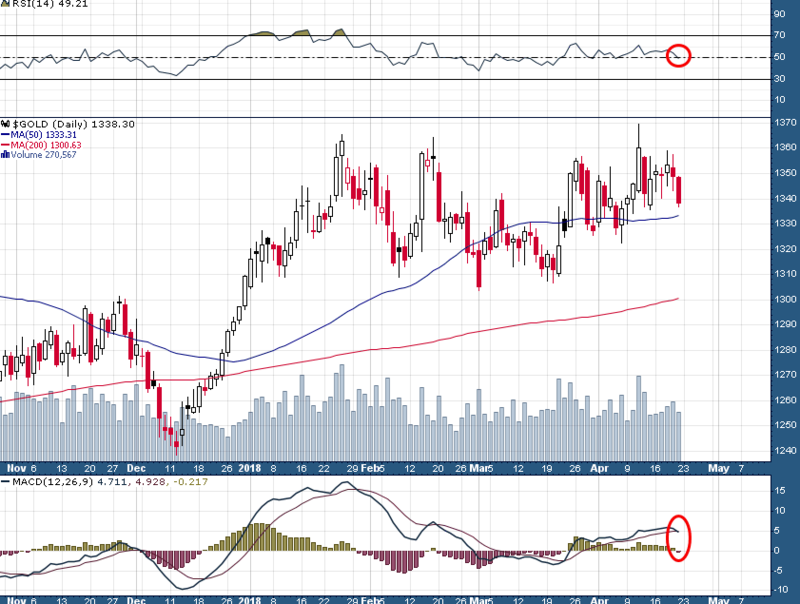 On the daily timeframe in gold the RSI(14) has begun crossing the median line pointing lower, while the first MACD bear cross of significance since January has taken place. It’s not time to panic yet, however, the situation is definitely much less positive from a technical perspective than it was a week ago.